The Phoenix chapter of the Professional Hockey Writers Association (PHWA) has named Coyotes right wing Owen Nolan as the Phoenix nominee for the Bill Masterton Memorial Trophy, given annually to the player "who best exemplifies the qualities of perseverance, sportsmanship and dedication to hockey". In his first season with the Coyotes, Nolan has exhibited the attributes distinguished by the award. Nolan, 35, has returned to the NHL after a knee injury suffered near the end of the 2003-04 season had kept him out of the game for over two years. Nolan ranks second on the Coyotes in goals (16) and points (38) this season and has played in 65 of the Coyotes' 72 games to date. The native of Belfast, Ireland has also provided leadership to the young Coyotes' team, wearing an 'A' on his jersey as alternate captain for much of the season. 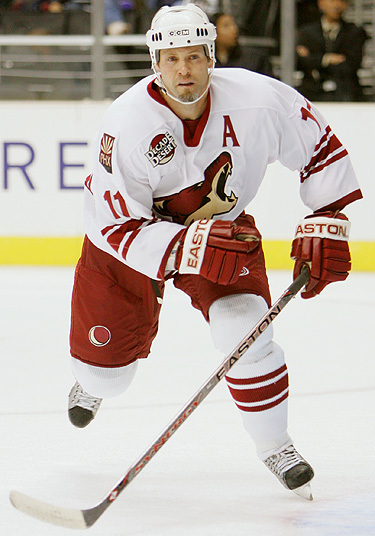 Nolan signed with the Coyotes on August, 16, 2006. Now in his 15th NHL season, Nolan has registered 365 goals, 408 assists, and 773 points as well as 1,650 penalty minutes in 983 career games with the Quebec Nordiques/Colorado Avalanche, San Jose Sharks, Toronto Maple Leafs and Coyotes. This season, he recorded his 400th career assist at Washington on Jan. 1 and his 750th point on Dec. 14 versus Columbus. The 6-foot-1, 208-pound forward has scored 30-or-more goals six times during his career and 40-or-more goals twice. Nolan has played in five NHL All-Star Games (1992, 1996, 1997, 2000, 2002), posting a hat trick in the 1997 game. Having played with San Jose for eight seasons from 1995-96 to 2002-03, Nolan ranks second in Sharks' history in goals (206), assists (245), and points (451). Nolan also won a gold medal with Team Canada at the 2002 Winter Olympics in Salt Lake City. He was the top overall selection in the 1990 NHL Entry Draft by Quebec. The PHWA chapters from all 30 NHL teams nominate one player from the team they cover. The winner of the award is selected by a poll among the 30 chapters of the PHWA at the end of the regular season. A $2,500 grant from the PHWA is awarded annually to the Bill Masterton Scholarship Fund, based in Bloomington MN, in the name of the Masterton Trophy winner. The Bill Masterton Memorial Trophy was presented by the NHL Writers' Association in 1968 to commemorate the late Bill Masterton, a player with the Minnesota North Stars, who exhibited to a high degree the qualities of perseverance, sportsmanship and dedication to hockey, and who died on January 15, 1968.